A forensic investigator on Wednesday used Oscar Pistorius's cricket bat to demonstrate how he would have struck the toilet door through which he had shot Reeva Steenkamp. State witness Lt-Col Johannes Vermeulen asked Judge Thokozile Masipa if he could take his jacket off and get out of the witness box in court GD of the High Court in Pretoria. He took the cricket bat, a Lazer English Willow Club Plus with several signatures on it, and took up position at the toilet door which had been set up next to the witness box. It was the actual door removed from Pistorius's home. Prosecutor Gerrie Nel asked Vermeulen to swing the bat as though he wanted to strike the brown, wooden door. The point where the bat touched the door was higher than the mark made when Pistorius struck the door with the bat. Vermeulen had to enlist the help of a police officer and Col Ian van der Nest to measure the height of the marks with a measuring tape. The exisiting mark, indicated with a white sticker, was 1,53m. The point where Vermeulen would have connected with the door was about 1.85m. To make the mark at 1,53m he would have had to bend over and swing the bat. "It's quite an uncomfortable position," said Vermeulen. He then got onto his knees and swung the bat again. There was laughter as he struck the door with a hard tap, instead of the soft knock he had intended. The point where the bat met the door was around 1,25m, suggesting Pistorius may have been on his stumps at the time. Pistorius mostly sat with his head down, busy with something on his lap as Vermeulen gave his demonstration. Vermeulen is the commander of the material analysis sub-section at the forensic science laboratory. 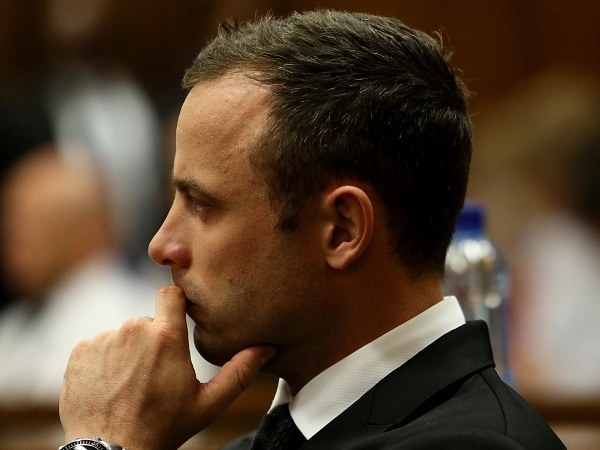 He was testifying about the cricket bat Pistorius use to bash open the door of his toilet, and about the door itself, through which he shot Reeva Steenkamp. He told the court he had more than 29 years of experience in scientific analysis and completed almost 1400 forensic investigations. Pistorius is accused of the murder of model and law graduate Steenkamp on February 14 last year. He is also charged with illegal possession of a firearm and ammunition, and two counts of discharging a firearm in public. He allegedly fired a shot from a Glock pistol under a table at Tasha's in January 2013. On September 30, 2012 he allegedly shot through the open sunroof of a car with his 9mm pistol while driving with friends in Modderfontein.